Synopsis: SWAMP are pleased to announce the release of the long awaited banTamP series from JOYO. These new creations offer classic real tube tones and pack a punch with 20 watts of power squashed into a tiny amp head weighing just 1.2kg! SWAMP are pleased to announce the release of the long awaited banTamP series from JOYO. Inspired and named after the boxing bantamweight division, JOYO's new creations pack a punch with 20 watts of power squashed into a tiny 163mm(L) x 110mm(H) x 140mm(W) amp head weighing just 1.2kg! Despite the size restriction, JOYO have not limited features and flexibility, including two channels, gain, tone and volume controls, an effects loop, and BLUETOOTH connectivity! Each banTamp model is voiced to be reminiscent of a classic sought after tone, some vintage, some modern. With all of these features coming in at an affordable price point, there's sure to be a real valve banTamp for everyone! Check out an extensive review of the new series in the video below. JOYO has packed a remarkable amount of tonal flexibility into the tiny banTamP chassis. The amps include two channels. The clean takes pedals very well, which makes it a great little companion for many situations where your â€œbigâ€ head is just not sensible. The 12AX7 circuit breaks up organically to create a variety of pleasing drive tones when the gain is turned up. If this wasn't enough sonic variety, Joyo has also squeezed in an FX loop, which enables time based effects (or Phasers, Flangers and Choruses) to be inserted after the drive section to keep the effects sharp and not prevent them from being too muddy. BanTamP includes one speaker out rated at 8Î© but it can also be operated at 16Î© with less power. The amp is small, but loud; its 20 watts can be quite a handful! For when quiet volumes are required, Joyo have built in a headphone out with speaker emulation. If all of these tricks weren't enough, banTamPs also feature BLUETOOTH connectivity. This means simple connection to BLUETOOTH enabled devices for playing music through the banTamP, great for playing along to backing tracks or learning songs during practice. 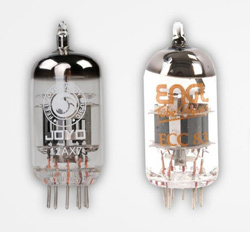 In order to develop the banTamp, JOYO's engineers trialed many different vacuum tubes in order to create a real valve tone they were satisfied with. Eventually they resolved to develop their own tube based on on the preamp 12AX7 tube from an ENGL Ironball. After collaboration with ENGL's valve manufacturer, a new tube and the banTamp sound were born!